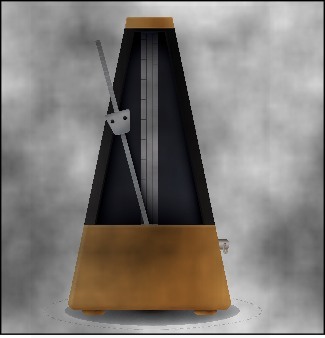 Here is the beginning of the slow air “Da Slockit Light”: The open D starts on beat 1, is held through beat 2, and the next note is played just before beat 3. 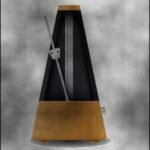 If you think only about getting all those notes played, you might not hold the open D long enough, and the timing of the tune will not make sense. We need to hear the open A at the right time, on beat 3, or the tune will sound confusing, and it will be difficult to play along with others. 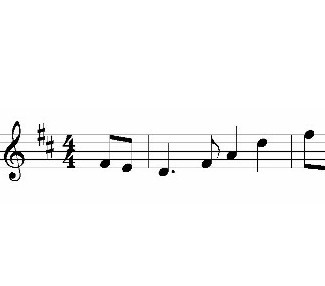 Here’s another way to write the same music: In this way the dotted quarter becomes a quarter note tied into an eighth note. 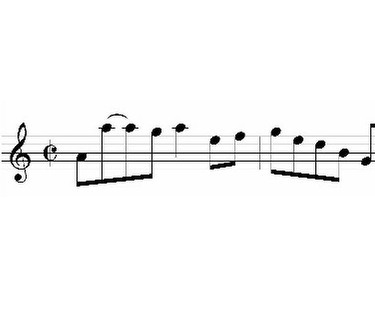 This is played exactly the same as the previous example but by writing out these two notes tied together, we can now see the beat note, instead of just feeling it as part of the dotted note. 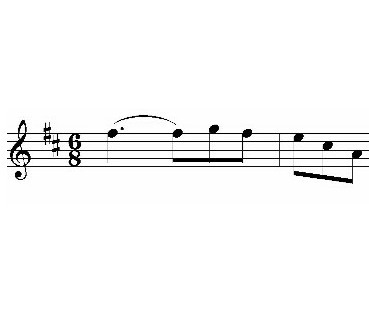 If you ever have trouble with the timing on long notes such as this, the cure is to actually play a note on the beat — in other words, leave out the tie, and play the two notes separately. This forces you to reserve time for the beat note. Then when you’re comfortable with the timing, you can continue to feel that beat even as you keep your bow moving through the tied note. 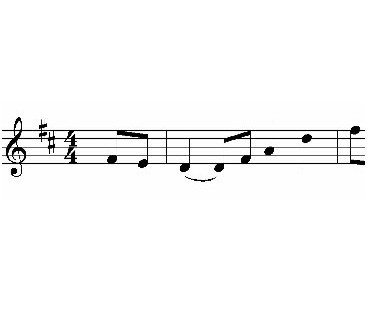 These observations apply also to syncopated rhythms, such as this, from “Sleep Soond Ida Moarnin”: In the old days this tune was written with a tie, like this: In fact, people used to push the bow to emphasize the second note in the tie, so you could hear that beat (actually it’s a half-beat, since this is in 2/2 and that note is on the “and” of 1 — “1 and 2 and” is the feel of the measure). Whether you actually push the bow to hear the second tied note, or just feel it, you are reserving time for it, and keeping the beat clear. In syncopation, as with the slow airs mentioned above, if you have a problem with the syncopated timing, the cure is to play all the notes with separate bows without the tie, so that you reserve time for the syncopated beats. Once you get used to feeling the beats as you play all the notes, you can then try to keep that beat as you connect the tied notes together on the same bow. 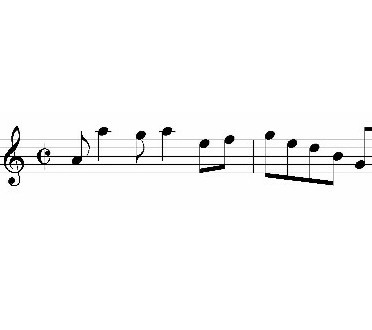 One last example of “the beat not played” is from Peter Barnes’s jig, “Fair Jenny”: In this case, we hold the first note for a full beat (dotted quarter in jig time), and hold the bow one more eighth note before playing the rest of the second triplet. We must feel that second beat strongly even though we’re not changing bow on it. Again, if there’s any confusion, go ahead and play the second beat note and ignore the tie — this will emphasize the beats, and keep the dancers happy! But once you’re comfortable with the timing, try keeping your bow going on that second note, but feel it clearly, and follow with the other two notes of the triplet, landing strongly on the beginning of the next bar on time. Next Next post: The Amazing Bow!